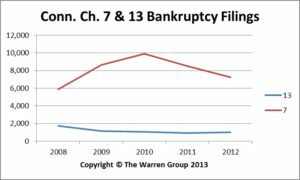 BOSTON, January 16, 2013 – Personal bankruptcy filings in Connecticut dropped by 15 percent to 7,242 in 2012, down from 8,518 in 2011, according to a new report from The Warren Group, publisher of The Commercial Record. Chapter 7 is the most common option for individuals who are seeking relief from their debts, and accounted for 86 percent of bankruptcy filings in Connecticut in 2012. In the fourth quarter, 1,628 filers statewide sought bankruptcy protection under Chapter 7, compared to 1,795 in the fourth quarter of 2011. The fourth quarter saw the slowest quarterly bankruptcy pace of 2012. The second quarter experienced the most bankruptcy volume, with 1,955 Chapter 7 filings. Fourth quarter bankruptcies were 22 percent of the annual total. In the second quarter, bankruptcies peaked for the year and represented 27 percent of the annual total. Chapter 13 bankruptcy filings increased more than 9 percent to 1,022 in 2012, up from 934 in 2011. 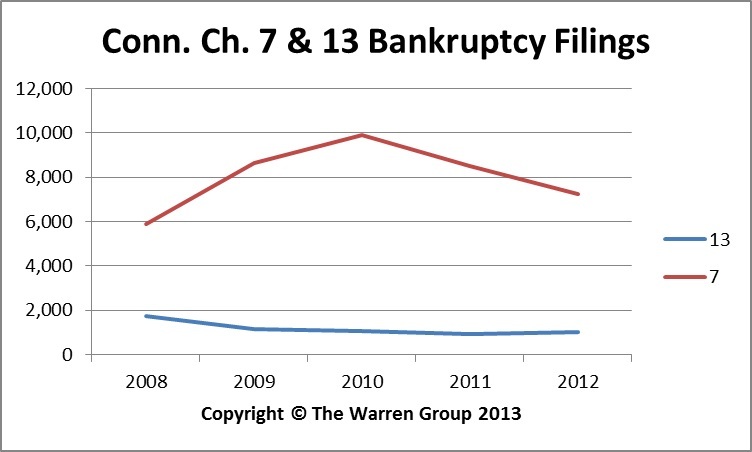 Chapter 11 filings, which are used for business bankruptcies and restructuring, also rose slightly last year. Filings increased 9.2 percent to 130, up from 119 in 2011. A total of 8,394 filers statewide sought protection under Chapter 7, Chapter 13 and Chapter 11 of the U.S. bankruptcy code in 2012, down from 9,571 in 2011.